Now that winter’s moving on and those hot summer days are moving in, you are likely getting your home prepared to keep all that heat outside where it belongs. While most already know the basics of getting their home ready to survive the heat and increase energy efficiency, there is one area that often gets overlooked in the process, and it can have a major impact all summer long – your front entryway. If you think about it, your entryway takes a serious beating all year long – that constant opening and closing and exposure to the elements can take its toll over time. However, when summer heat hits, those issues increase even more. While you’re working on preparing your home for the summer, make sure you keep these tips in mind as well to ensure your entire home is ready. Your entryway is exposed to the sun, heavy rains and even strong winds throughout the summer months, and if you are aren’t being proactive, you could have to replace your door much sooner. One of the first things you should do is check the condition of the paint. If you notice any peeling or chalking, it’s time to sand your door and give it a fresh coat of paint. Doing this will not only give your entryway a facelift, it also adds protection against rain so that it can resist the elements even longer. You should always check the seals around your entryway to make sure they aren’t showing any signs of damage or rot. These seals will keep the hot air outside, and prevent the cooler air from seeping out to provide better energy efficiency. If your door is flush and doesn’t have additional seals, make sure you take a quick look all the way around to make sure there are no gaps. Even a small gap can have a big difference on the amount of heat that makes it indoors. Don’t forget to check around the top and bottom of the door as well, as these areas can have issues that may not be readily noticeable since you can’t see them as easily. Take a look at your door jamb and see if you can see a difference between how it looks on the outside, and on the edge. Most doors are unfinished in this area, and that means they aren’t protected from insects that can burrow into them or fungus. Add a coat of primer or borate to make sure you aren’t leaving any exposed areas to those critters that want in out of the heat just as much as you do. This will also add valuable protection against any moisture that might make its way between the edges of your door, which will protect the entryway from mold and fungus growth. 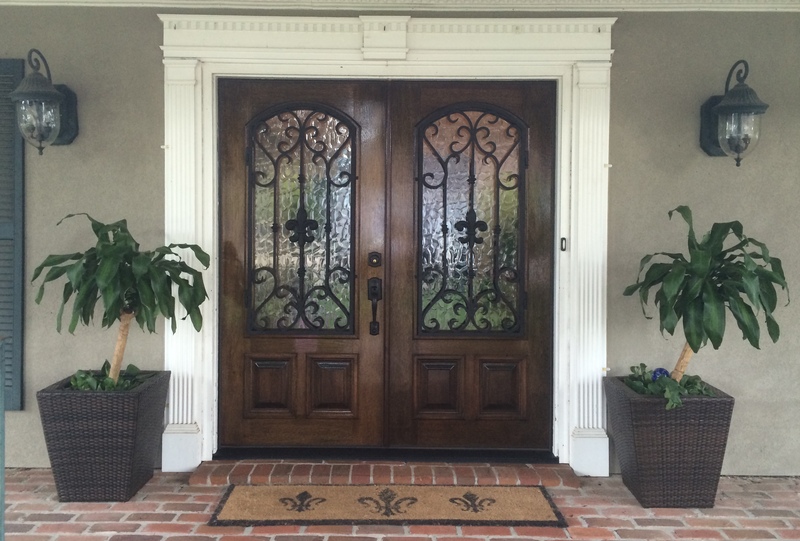 If you have a wooden door in your entryway, you may find that the hot summer temperatures and humidity make it stick. If this happens, do not try to shave it down. While it will fix the problem now, when winter hits, you will discover that you’ve created an even bigger problem when the door shrinks back down to size. All of the areas that you shaved down are likely to result in gaps, which means additional maintenance to try to keep the cooler air out. If you are considering replacing your door, you can avoid this issue altogether by opting for fiberglass. A fiberglass door won’t shrink and expand, and it provides greater energy efficiency than wood as well – not to mention that critters can’t burrow into it, and fungus typically can’t grow on it!